Courtesy DeGolyer Library, Southern Methodist University, Dallas, Texas, Ag2008.0005. On May 1, 1885, old west Austin was beset by an all-night crime spree that included numerous attempted burglaries and assaults — so many that the Austin Daily Statesman commented it would be “monotonous to recount them all.” The incidents that night were characterized by an almost juvenile or drunken recklessness, with the perpetrators trying to enter servant’s quarters, sometimes successfully, sometimes not, banging on doors and windows, throwing rocks, frightening women and leaving a trail of screams, shouts and gunfire behind them. They quickly dispersed when confronted but would often return to rile everyone up all over again. In spite of all that, no one was seriously injured that night, and the troublemakers were lucky to escape more than once. When a man entered the room of an “elderly colored woman” employed at the home of J. M. Brackenridge and threatened her, the feisty woman instead grabbed him, threw him out of the house and continued to wallop the would-be ruffian who only managed to escape her tenacious grasp by extricating himself from his coat and hat. 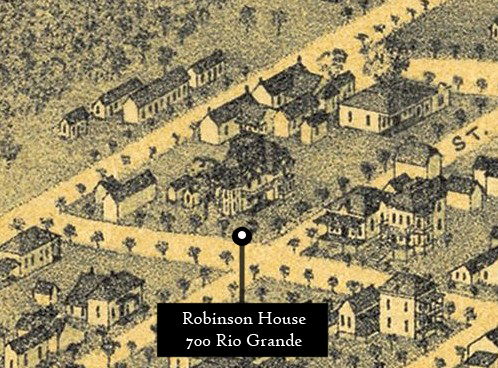 The home of John H. Robinson, located at 700 Rio Grande Street, as noted above, was one of the locations where the perpetrators were lucky to escape gunfire. James D. Sheeks, as mentioned above, was a local attorney who boarded at the Robinson home. A neighborhood hackman (cab driver) called Red is also mentioned along with Sheeks as having fired shots at a fleeing suspect. 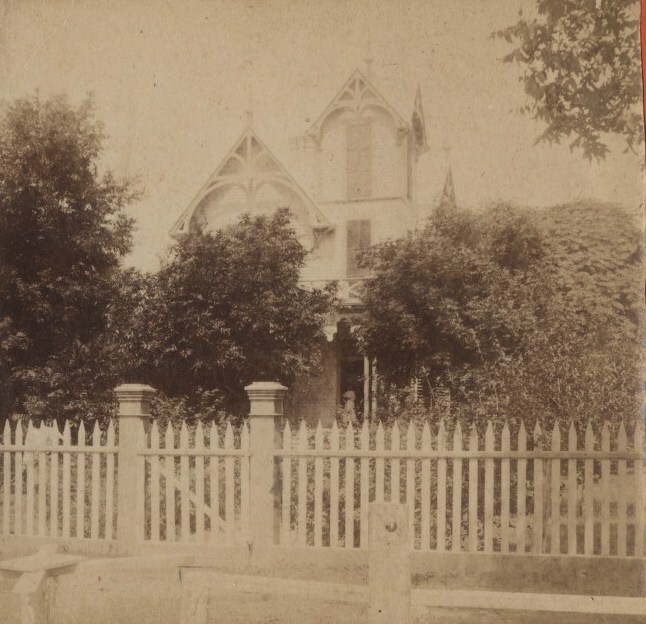 The photograph above by Austin photographer S. B. Hill, shows the Robinson house as it originally looked in the 1880s. In the photograph the house appears to have gabled roofs, a detail that corresponds to the house as it was drawn in 1887 by Augustus Koch for the Austin birds-eye view map. The railing around the upper floor is also visible in the photo and is clearly present in the illustration. The house was moved 50 feet north from its original location in 1909. It is currently located at 702 Rio Grande Street.